This morning of 25 January 2017, members of the House of Representatives Sub-Committee on Correctional Reforms, representatives of the Juvenile Justice and Welfare Council (JJWC), and proponents of the bills that seek to lower the minimum age of criminal responsibility (LMACR) from 15 to nine years old, will be having a closed-door meeting to discuss the proposal. Child rights advocates consider this a potentially pivotal event in the progress of the consolidated LMACR bills in the legislature. There also looms the possibility of negotiations to lower MACR to 12 instead of nine as originally proposed. This is still an unacceptable compromise which advocates will relentlessly reject. The Child Rights Network (CRN) reiterates its call for the House leadership to practice due diligence in its course of action on this bill that could put the lives and dignity of Filipino children on the line. We appeal to the decision makers in the House of Representative to consider all arguments from various disciplines, and to observe reason tempered with compassion in the proceedings for the bills. Before this crucial executive meeting with the proponents—including no less than House Speaker Pantaleon Alvarez, principal author of House Bill 2, which is one of the five bills filed—we remind our legislators that lowering MACR is detrimental to the best interests of children in conflict with the law (CICL) and would deny them of their rights to survival and development. Various studies strongly indicate that criminalizing children leads to recidivism, and in several cases, increasing transgressions not only in frequency but also in gravity. Detention and/or incarceration of children have also been linked to adverse effects on a child’s mental, physical and emotional development, owing to possible abuse while detained. Furthermore, incarceration of children results in lost opportunities for advancement through education and future employment. Moves to lower MACR disregard scientific evidence that a child’s brain is structurally and functionally immature, which influences their decision-making and increases their tendency to engage in risky behaviors during adolescence. Should we allow these bills to be passed, the wrath of the law’s punishment would be most heavily borne by the children of poorest Filipinos. Arguments for lowering MACR citing crime reduction ignore the systemic nature of criminality, and as such, requires a systemic approach involving poverty reduction and rehabilitation programs to be addressed. Meanwhile, arguments for lowering MACR on the basis of protecting children from being used by criminal syndicates them violates the same right to protection that it seeks to fulfill, doing more harm than good and proposing a wrong solution to the problem. 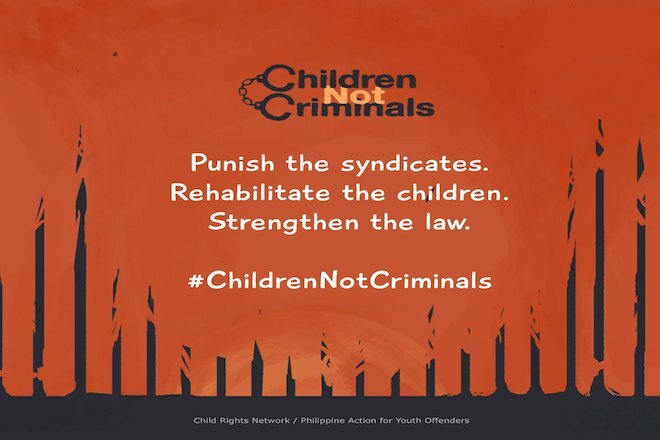 The Child Rights Network is consistent in its opposition to all moves to lower the minimum age of criminal responsibility, and tireless in its crusade to uphold the dignity of every Filipino child by strengthening the mechanisms and initiatives for rehabilitation and reintegration as provided for by the existing law, the Juvenile Justice Welfare Act.